Mortice & Green provide sash window repair and replacement in all London regions including of course west London. 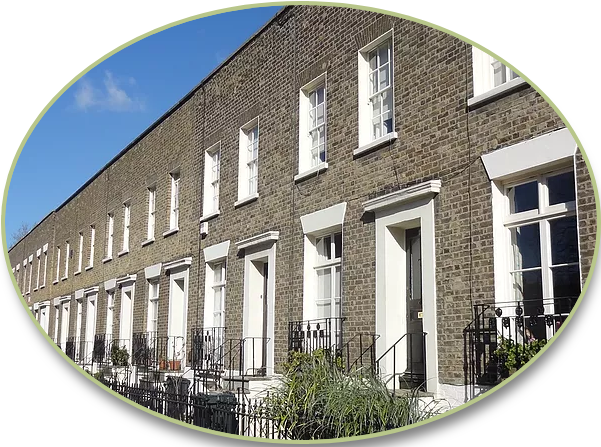 We have more than twenty years of working with sash windows including the repair and replacement of traditional wooden windows we are probably one of the best sash window companies in West London. We have many satisfied customers in virtually all parts of West London so providing you with local excellent references from our previous clients is no problem at all, in fact you could possibly even be within walking distance from a property we have worked on! A full list of all the postcode areas in West London we cover can be found at the foot of this page, we may also consider working even further afield if we are able to, give us a call for more information as we love to help! The capital of England covers so much area that it has been broken down into five sub regions referred to as west, north, east, south, and central London. West London is further divided into seven boroughs. The boroughs making up this region are Hillingdon, Richmond upon Thames, Hammersmith and Fulham, Ealing, and Brent. This area is home to many of London’s wealthiest inhabitants, which explains the numerous affluent neighborhoods with their opulent homes. Properties here can cost in excess of tens of millions of pounds. The region’s economy is driven mostly by its two largest employers, Heathrow Airport and the University of West London. Heathrow is located in Hillingdon and ranks third among the busiest airports in the world in terms of international traffic and sixth busiest overall when it comes to total passenger traffic. It serves as the primary base of operations for Virgin Atlantic and the main hub for British Airways. More than a quarter of a million people in the UK are employed by the aviation industry, which plays a vital role in maintaining the country’s competitiveness in the global market. More than 76,500 of those people work at Heathrow Airport, making it the largest employer in the UK. In Ealing, the University of West London has an enrollment of more than 12,000 students with applicants coming from Ealing, other parts of London, every region across the UK, and abroad. The University contributes to the local and national economy through direct activities as well as the spending by all of the students attracted from other locations and the spending of individuals visiting those students while in attendance. Nearly 1,000 staff members are employed by the University. Hampton Court Palace is dubbed the playground of the Tudors and for good reason. Originally built during the early 1500s by Cardinal Wolsey, Lord Chancellor to King Henry VIII, the monarch later seized the property from Wolsey in retribution for the Pope’s refusal to grant the King’s divorce from his first wife Catherine of Aragon. Later on, Mary, William and the Georgian kings added their own personal touches to the property, including the grand staircase with its intricate fresco featuring William as Alexander the Great. The 16th century quarters, with its massive kitchens, cellars and spice rooms offer a fascinating look at royal life when King Henry VIII was large and in charge. Actors in period costumes frequently perform short vignettes depicting typical everyday scenes that provide a glimpse into court life. Other places to explore at the palace include the rose gardens, the Royal Maze, and the indoor tennis court. The Magic Garden is an interactive playground located within King Henry VIII’s Tiltyard, where spectacular jousting tournaments were once held. At least one member of the current royal family calls this part of London home, at least part of the time. Prince Harry has a cottage on the grounds at Kensington Palace, which serves as both a royal historic landmark and a working palace. Highlights of a Kensington Palace tour include the gardens, the King’s Gallery and the Queen’s and King’s state apartments. Kensington Gardens was originally part of Hyde Park and played host for King Henry VII’s famous deer chase. William and Mary created a separate park after taking up residence in the late 1600s. The Queen commissioned Dutch style box hedges and flower beds to remind her husband of his native land. Notting Hill played a starring role in the 1999 movie that shares its name and features box office stars Hugh Grant and Julia Roberts. Since then, this quaint village has become a favorite haunt for movie buffs that want to visit the film’s various locations firsthand. There’s even a popular film tour that focuses on all the highlights. One of the most popular attractions in Notting Hill is Portobello Road. This area is a mecca for shoppers any day of the week with an eclectic mix of art galleries, food stands, and antique shops. On Saturdays it transforms into a street market with hundreds of additional vendor stalls dotting the sidewalks and selling all kinds of merchandise, including shoes, antique items, knick-knacks, vintage clothing, music, and more. Hidden cafes, quiet gardens, and quirky bijoux houses are just waiting to be discovered in this quaint part of the capital city. Every summer, Notting Hill plays host to one of the most vibrant shows on Earth as people gather from far and wide to partake in the continent’s largest street festival. Notting Hill Carnival takes place annually on Banking Day in late August. Since 1964, the capital’s Caribbean residents have used this occasion to showcase their colorful traditions and culture. Music fills the streets for two consecutive days as bands perform everything from salsa to reggae, dub, and steel drums. Street vendors keep the crowds fueled with fried plantain, jerk chicken and other Caribbean delicacies. In addition to the live musical performances, revelers delight in parades featuring soca floats in an ever-changing kaleidoscope of colors. In additon to all the rest, this part of London has some breathtaking architecture to gaze upon. Among the most magnificent edifices are Westminster Cathedral, the Shri Swaminarayan Hindu Mandir in Neaden, the Wharncliffe Viaduct in Ealing, and the Gurdwara Sri Guru Singh Sikh temple in Southall. Visitors can even head over to Abby Road and walk on the zebra crosswalk in the footsteps of Peter, Paul, George, and Ringo as they imitate one of the most well known music album covers of all time.